Mopra is a radio telescope in Australia, located in the Warrumbungles Mountains of the State of New South Wales. Mopra is a special kind of radio telescope, able to record the high frequency radio emission that comes from molecules in space. Interstellar space is not empty; it is full of gas and dust. Along the plane of our Galaxy this gas forms into giant clouds of molecules, some weighing up to a million times the mass of our Sun. In total, there are around one billion Solar masses of material found in the interstellar molecular clouds of our Galaxy. What happens inside these clouds is pivotal to determining the Galaxy’s future form. It is the subject of much fundamental scientific research. Mopra is currently owned and operated by the CSIRO, however, the CSIRO has announced it will cease funding the telescope at the end of October. #TeamMopra is what happens when a bunch of astronomers decide that what we really need to do is convince the public and the politicians that our science is important. A large part of that will be taking our data products public, sharing with the community both our maps of the sky and the skills needed to understand what we are looking at. We want you, the person reading this, to take an interest in the weird and wonderful molecular clouds that comprise so much of our Milky Way, and to that end we’re blogging about our research and making it available. We’re in the process of testing a bunch of tutorials on how to manipulate our maps (at lower resolution than professional astronomers use, but the higher resolution maps are available to all via the Australia Telescope Online Archive) and make beautiful images of the sky in radio light. Once we’ve got those sorted, we’re going to write more detailed tutorials showing you how to characterise your clouds, to estimate their distance and mass and other properties. We want you to join us and become part of our team, helping us discover new things about the Milky Way and publish them for all the world to see. Michael Burton is Professor of Astronomy at the University of New South Wales. His research specialty is how stars form, inside the giant cocoons of dust and gas that line the plane of our Milky Way Galaxy. To peer inside their depths requires the use of infrared telescopes. Michael is thus known as an infrared astronomer, one of those people who glow in the dark. This seems to keep taking him to Coonabarabran during the Full of the Moon, to use the Anglo Australian Telescope, which has some people wondering whether the howling sounds at Siding Spring really come from pining koalas. Infrared astronomy has taken Michael around the world, and he has observed on every continent, as well as high up above the Earth from an airborne telescope. Michael learnt his trade in the rarefied air of Mauna Kea, the 4,000m high observatory on a dormant volcano in Hawaii, where he ran to every winter while supposedly studying for a PhD in Edinburgh in sunny Scotland. Following a few years with NASA in California and the Anglo Australian Observatory in suburban Epping, he ended up in the School of Physics of UNSW in 1993. Alas, there has still not been another appointment there since. From UNSW he has pioneered the development of astronomy in Antarctica, making the first measurements of the infrared sky at the South Pole in 1994, and is now leading the drive the build the 2-m Douglas Mawson Telescope at Dome C on the high Antarctic plateau. Michael has recently become a mm-astronomer, which doesn’t mean he has shrunk, but instead moved into new field, in between the infrared and radio bands. 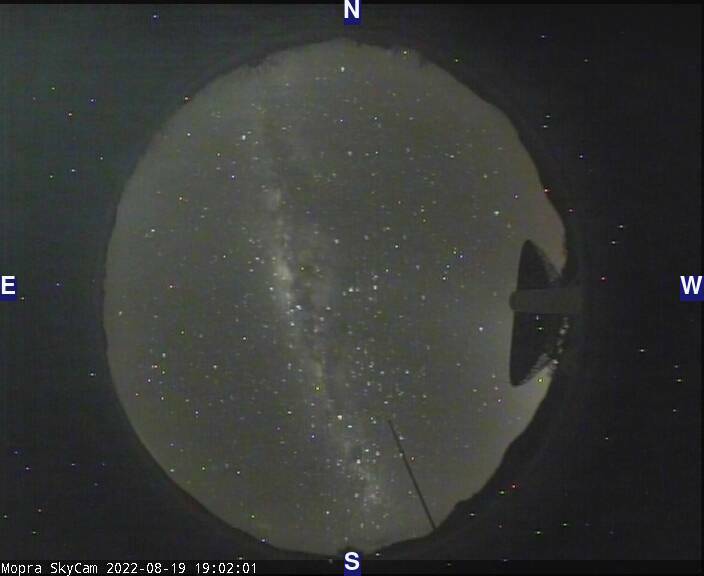 He now finds himself now coming to Coonabarabran to use the Mopra millimetre-wave telescope for this purpose, the largest such telescope in the southern hemisphere. Catherine Braiding is a postdoctoral researcher at the University of New South Wales, working on the Mopra Southern Galactic Plane CO Survey, which aims to map the distribution and dynamics of carbon monoxide in our galaxy. Together with maps of neutral carbon from Nanten2, and C+ from the HEAT telescope in Antarctica, these data will allow us to understand how molecular clouds form. Catherine has also modelled the influence of magnetic fields (in particular, the Hall effect) on the gravitational collapse of molecular cloud cores into protostars, and the interactions that occur between supernova remnants and molecular clouds. She tweets as @AstroCate (not to be confused with the famous and awesome @AstroKatie) and can most often be found procrastinating on Google Plus (I know, I know). there is this computer game, Elite:Dangerous, where you are able to roam freely in the whole galaxy, exploring it in your spacecraft(great fun ;)). thank you for your support and for your suggestion. We really appreciate it. Elite is a very well know game since the first part of the ’90. We are managing to establish contacts with many developers, and your message give us more ideas. Hi guys, I’ve backed to hopefully name a bunch of inter stellar molecules after my kids… but would like to “back again” for some other presents for other friends & family. Kickstarter doesn’t have a facility to back the same project twice – can you please let us know how we do this? Congrats on launching your campaign on Kickstarter! We would like to interview you for 10-15 minutes for our online show about crowdfunding. Please let us know what would be a good time for you. Click the link http://www.meetme.so/MakerParadise and choose 2 times that would work, and then we will write back to confirm and send you a list of the questions. * What inspired you to consider crowdfunding? * What surprised you about the process versus what you thought before you started? * What advice would you give to someone who was scared to try? The interview will only be about 10-15 minutes long. It should help you if you want to do further crowdfunding in the future, and also you will be helping other people who might be scared and need to hear from real people who have gone through the process like yourself. We’ve been talking to teams in Spain, France, Italy, Germany, US, Canada, and Australia for weeks. And we love to have you on our show while your crowdfunding project is live. It is more interesting for the audience, and it better for your project too. Because you can get more backers. We help people take the first step in crowdfunding!